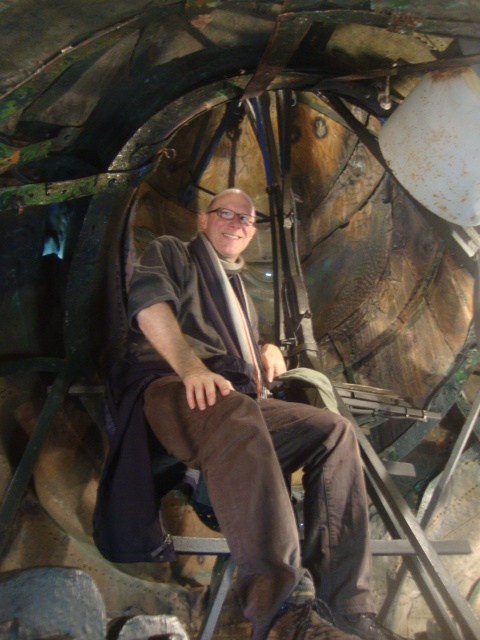 Sitting inside San Carlo’s chin is surprisingly comfortable. The rest was welcomed after the rather harrowing ascent up the saint’s midriff – a climb not recommended for pregnant women, people prone to dizziness and those still recovering from the flu. There is a good reason for the karabiner safety system alongside the perfectly vertical metal ladder – there seemed to be less reason why it wasn’t in use. After being cuddled by Carlo, I stood up to look down his nostrils, and then stretched on my tip toes to gaze through the eyes of the world’s largest saint. 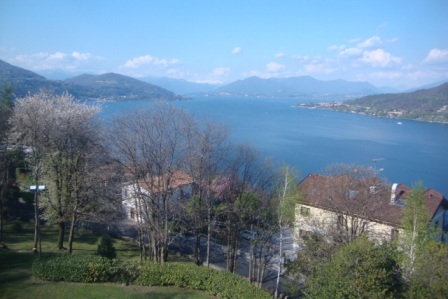 The panoramic views of Lago Maggiore are magnificent. 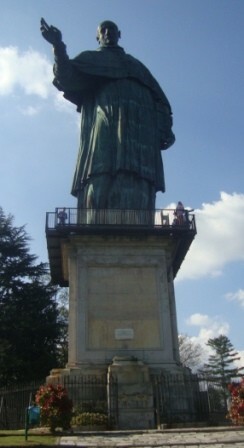 Il Sancarlone, San Carlo’s colossal copper likeness, is formerly the world’s largest metal statue and, even today, has only been surpassed by the Statue of Liberty. For four Euros, you, too, can spend time in the head of Milan’s sixteenth-century holy man. San Carlo Borromeo, cardinal and archbishop of Milan, was born on October 2, 1538 in the castle of Arona (Rocca di Arona) overlooking Lago Maggiore. He died in Milan on November 4, 1584. The promotion of his cult began almost overnight, and he was canonized by Pope Paul V, just sixteen years later, on November 1, 1610. The chief promoter of the cult of San Carlo was San Carlo’s own cousin, Federico Borromeo (1564-1631), also cardinal and archbishop of Milan. Federico oversaw the two cycles of devotional paintings (the Life of the Blessed Carlo and the Miracles of Saint Carlo Borromeo), commissioned in celebration of San Carlo’s beatification in 1602, which still hang in the Milan Duomo. Federico also supported the construction of San Carlo al Corso in Rome, which was begun in 1610. However, Federico’s pet project was closer to home in Arona. Federico envisioned, perhaps as early as 1598, a sacro monte, or holy mountain, in memory of San Carlo and surmounted by the world’s tallest statue. The original plan of the holy folly was for the erection of fifteen chapels, following a pathway from the lake to the statue square, each depicting through sculptures and frescoes an important event in the life of the saint. Federico laid the first stone of the sacro monte on July 13, 1614, and a seminary was built between 1620 and 1643. Yet, by 1656, only four of the chapels were finished. The grand scheme of San Carlo’s sacro Monte was never completed – but the statue itself became a smashing success. The statue’s first stone was not laid until 1692 – some sixty years after the deaths of Cardinal Federico (d. 1631) and Giovanni Battista Crespi, known as Cerano (d. 1632), the statue’s designer. The statue itself – variously known as il Sancarlone, il Colosso di San Carlo Borromeo and il Colosso di Arona – was built by Bernardo Falconi and Siro Zanelli and was dedicated on May 19, 1698 by the archbishop of Milan, Cardinal Federico Caccia (1634 – 1699). An adjacent church dedicated to San Carlo was completed between 1725 and 1728. Today, the complex is maintained by Milan’s Biblioteca Ambrosiana. Frédéric-Auguste Bartholdi (d. 1904), the designer of the Statue of Liberty, traveled to Arona to study the structure of the local statue, finally settling for a design that was roughly twice the dimensions of our copper Carlo. At the base of Bartholdi’s Liberty, which was dedicated on October 28, 1886, is a plague acknowledging her shorter Italian model. Rocca di Arona, the birthplace of San Carlo, was razed to the ground by Napoleon’s army in 1800.